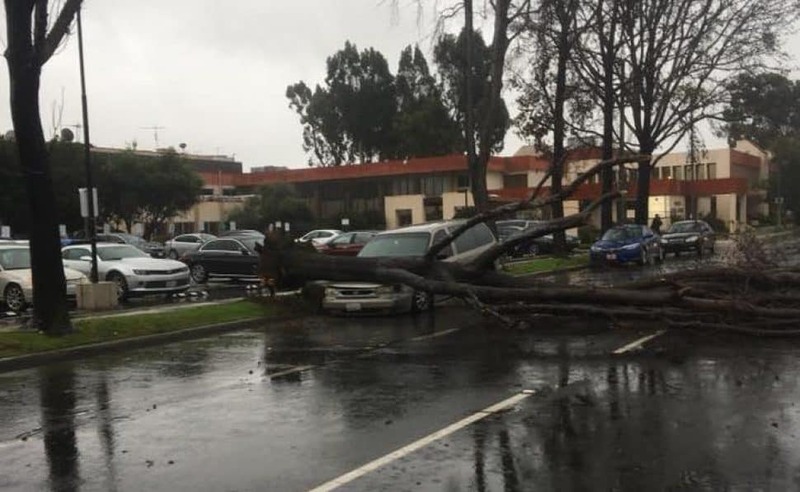 A downed tree landed on the hood of a car at Pacific Avenue and 28th Street. Photo by Nathan Brava-Partain. 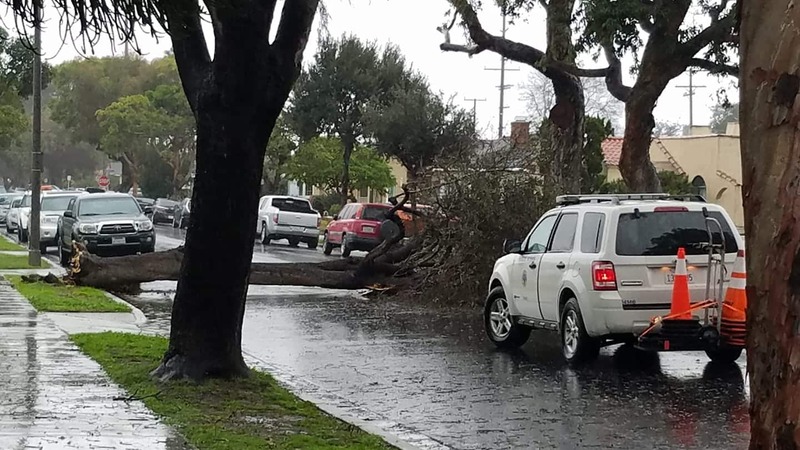 Rain and gusty winds brought down trees across Long Beach today, causing damage to cars and homes. 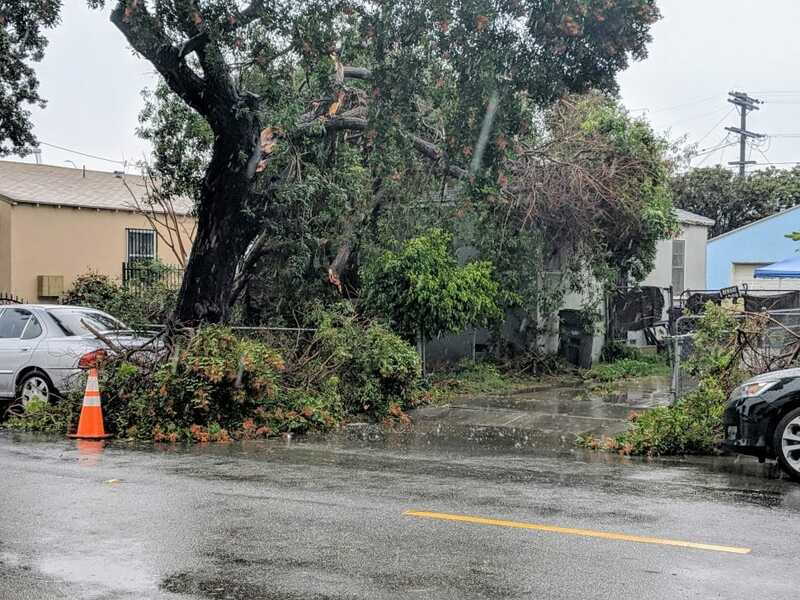 The Public Works dispatch center received 59 calls about downed trees on Saturday, according to a Long Beach Police Department spokesman. Soil saturated by the rain combined with the wind often causes this, a Long Beach Fire Department spokesman said. By 5 p.m. LBFD received over 30 calls for downed wires. 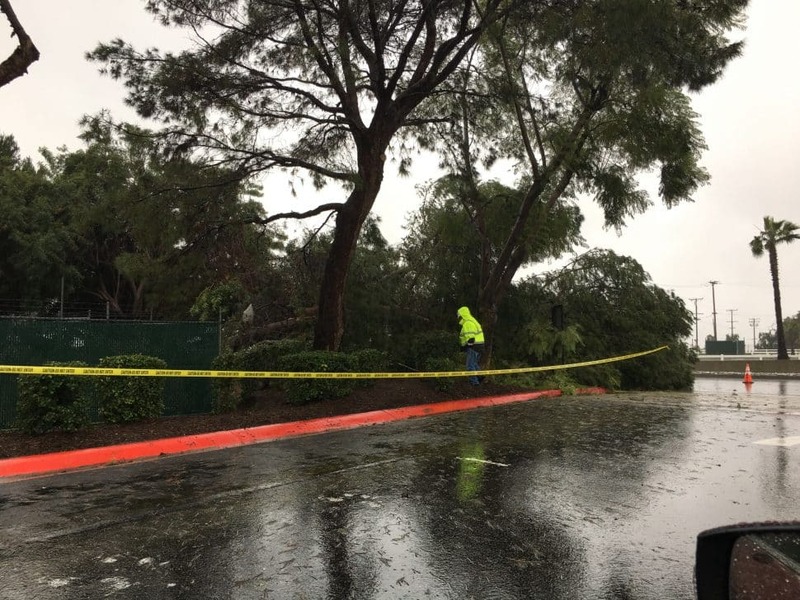 So far nobody has been reported injured, but crews were working to clear roadways as the rain continued to fall until about 4 p.m.
More than an inch of rain doused Long Beach over Friday night and Saturday morning with wind gusts sometimes topping 35 mph, according to the National Weather Service. A blocked drain flooded the streets near Orange Avenue and Artesia Boulevard, pushing water into a nearby underground parking garage. The water rose to about ankle-deep, according to an LBFD spokesman, and a swift-water rescue team was called out to help unblock the drain and pump out water. Nearby, fire station 12 also had minor flooding damage from the blocked drain. Crews work to clear away a tree near 31st Street and Eucalyptus Avenue. Photo by Ali Morgan Barrett. The rain is expected to continue through Monday with winds tapering off earlier on Sunday, according to the NWS. A flash flood watch and high surf advisory were also in effect. 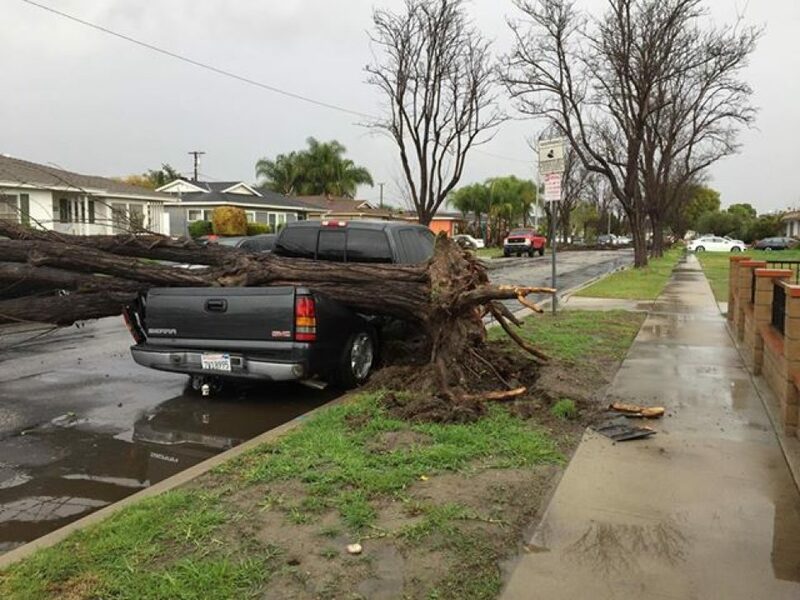 A large tree fell on top of a truck near 27th Street and Clark Avenue. Another tree also fell about 100 yards away from it, with both blocking the street. Photo courtesy of Chris Smith. Another felled tree did some damage to a bus shelter near Cherry Avenue and Skyline Drive in Signal Hill. Photo by David Sommers. A tree fell on top of a home near Pacific Coast Highway and Walnut Avenue. Photo by Valerie Osier. 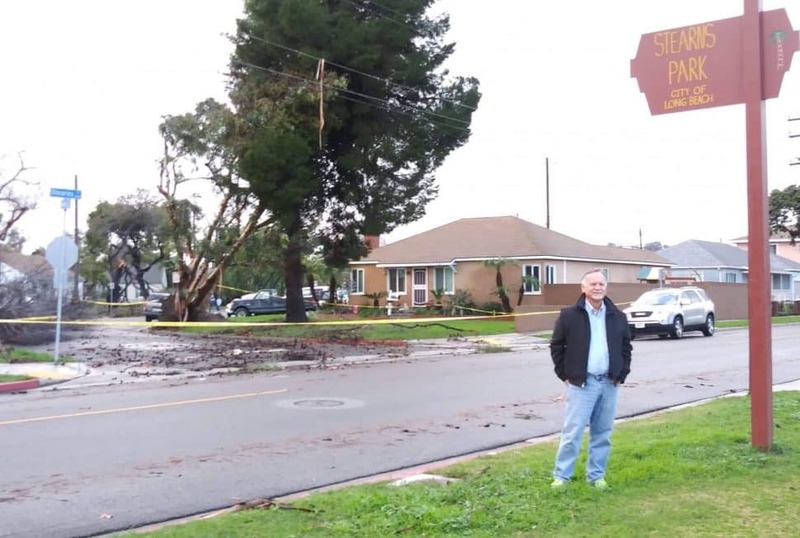 Councilman Daryl Supernaw inspecting damage to a street off of Stearns in East Long Beach. Photo courtesy of Josephine Villaseñor.